Mark. K. asks: Why does peanut butter stick to the top of my mouth? Peanut butter also contains a lot of protein (about 25% by mass, give or take depending on the brand). Protein has a tendency to soak up moisture via osmotic pressure, thus absorbing much of the saliva in your mouth. This effect is made worse than with most foods due the fact that peanut butter also has incredibly low water content (only about 2%. For reference, jerky, which is by its very definition “dried meat”, tends to have a water content of about 23%.) It’s also worth noting that bread can similarly absorb some of the moisture from your mouth, which combined with the peanut butter, can leave your mouth incredibly dry when eating a peanut butter sandwich. But wait, there’s more. In addition to the oil and lack of moisture to wash down the peanut butter with, there’s a process in the food industry known as “supercritical fluid extraction” which uses CO2 to separate chemicals and compounds. SFE can be used for a multitude of tasks in the food industry, like decaffeinating coffee and extracting essential oils and flavours from plants and foods. In regards to peanuts specifically, it can be used during the manufacturing process of peanut butter to help keep the oils and solids from separating without the need for other more traditional stabilizers like unhealthy hydrogenated oils. And, as this paper in the Journal of Food Science explains, one side-effect of SFE in peanut butter manufacturing is that it increases the relative “adhesiveness” of the peanut butter. Another thing that makes peanut butter so deliciously sticky is its texture, or lack thereof. Smooth peanut butter is noted as being far more likely to stick to the roof of your mouth than the chunky kind because the smooth, thick, deliciously creamy surface can form a “suction cup” of sorts that can anchor the peanut paste to a person’s palate. Have you ever got your foot stuck in mud? Same type of thing here. Spiders and Webs – Why Don’t They Get Stuck? Joseph L. Rosenfield in 1928 invented the churning process that gives peanut butter the smooth texture we have today. He originally licensed this process to Pond Company, who makes the meltingly good Peter Pan peanut butter. In 1932, he started his own peanut butter company which he named Skippy. Experiments have shown that the levels of peanut oil and peanut seeds in peanut butter have a marked effect on its overall “adhesiveness” and “spreadability”, with higher oil and seed content resulting in more spreadable, but more adhesive peanut butter and vice versa. Chocolate spread, more specifically Nutella, has a lower water content than peanut butter (1%) but it contains far less protein, showing how much difference the protein makes to the “stickiness” of peanut butter. For those living outside of the PB&J eating world, here are a couple pro-tips if you ever decide to try America’s favorite gooey sandwich. 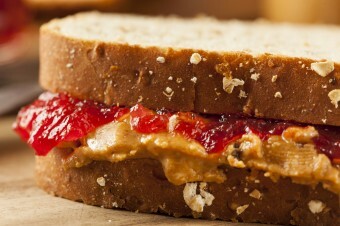 In order to keep the bread from getting soggy from jelly over night or throughout the day in a lunch box, put peanut butter on both slices of bread and then put a skiff of jelly inbetween. The oil in the peanut butter will keep the moisture in the jelly away from the bread. Another PB&J pro-tip: toast the bread first, then immediately add peanut butter to both sides (preferably an ultra-creamy type like Peter Pan or Skippy) with your preferred amount of jelly in the middle. Next, place the slices together and allow the peanut butter a little time to melt an the jelly to warm, then eat it while it’s still warm. I usually make my own peanut butter unless I’m being lazy (it’s cheaper and yummier). Though my peanut butter is just as creamy as several name brands it’s noticeably less sticky. I’ve always wondered why. As my food processor is incapable of the SFE process I think I have my answer now.